That connotes the Ranil will hang on as leader until 2030. In other words , the UNP will be either gone or will be in the opposition until 2030. Well that is the UNP. Anyway who will vote for the UNP at the next election. I am completely dissapointed after reading this news. Only God can save UNP. You have failed the country and the party. I strongly believe you will be kicked out of the party well before 2030. By 2030, he would have destroyed the whole country! 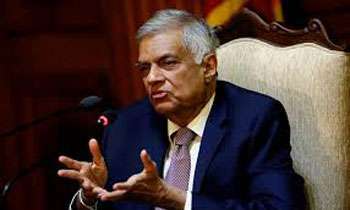 UNP WILL HAVE TO SUFFER ANOTHER LENGTHY 12 YEARS ??? if you dont move over now, there wont be a party to handover in 2 years. I think you should change your wall calendar... It is 2018 now, not 2000. OMG there are 12 more years for your retirement? How can you harvest when the roots of the paddy itself are rotten? UNP loss the good opportunity of No confident motion. Is it Akila kolla you are grooming ?? God bless the party and the country. hahahah here we go,... cat has jumped out of the bag..... by 2030... huh .. after died ? No need. Anyway, AFTER your death, the UNP committee will handover LEADERSHIP to someone, provided UNP exists till 2030 because you will destroy the party yourself..
Ha ha ha can we see the faces of UNPers who voted for Ranil in the no confidence motion? Let alone leadership this man't won't leave the prime minister post in 2020. Already conspiring with foreign embassies how to hang onto power. Dear DM, Please don't misinterpret his statement, shows the DM integrity, I was listening to his speech live. What he told was that together with all nurtured leaders, UNP will remain in power until 2030. Sajith/ Navin should be given. They are young leaders. The moment this news appeared stock market went all red! Why so early ? Make it in 2050 ! Another long term projection - earlier 2025 for the reviving of the economy now 2030 for the handing over of the Leadership...like to hear his projection for the UNP demise...after all he is totally responsible together with those who have lost their memories but speak about the history of the party!! RW - must know what the average Sri Lankan thinks of him - In Short and Sweet RW is considered as the MOST UNPOPULAR LEADER ever in the history of the UNP . Good luck RW Keep dreaming ! . If this man continue to be the leader of UNP.. that will be sublimation of UNP. Dear PM, You are the most intelligent leader we had. Your good thought will make Sri Lanka like heaven in 30 years. So, we all can have wonderful life there. You visionary leadership will make our country very very fortunate place in the whole world.Long live our beloved leader. Ranil will be the PM till 2020 then he will be the opposition leader for another 10 years. Any good leader must know of a "drop dead" situation. In other words any human can drop dead with no notice. That situation requires a person to take over without letting equals squabble. This means thathat a GOOD leader MUST Identify his deputy - the next leader. R W you fail miserably by this yardstick. Indeed pathetic. Sajit and Naveen should be made leader and deputy ASAP.